“On Tuesday morning the streets were filled with people in victory mood. Shops were closed and everywhere, from private houses, shops and public premises, flags and bunting were quickly hoisted and soon the whole town looked gay in the bright spring sunshine. Children out with parents carried flags, young people sported them on their cycles and some young women wore flags as sashes. Over the town hall flew the Union Jack, the stars and stripes, the hammer and sickle of the Soviet Union, the tricolour of France and the flag of the Chinese Republic. Messrs Dawson and Abbott were rigging up loudspeakers on Gainsborough’s statue so that the public could hear Premier Churchill’s broadcast at three o’clock. At 5pm, the mayor, accompanied by the town council and officials read a statement from the town hall steps, after which he invited everyone within hearing to attend a short thanksgiving service in St Peter’s Church. Music for dancing was broadcast at Belle Vue and the Market Hill during the afternoon and evening. At 9.30 a bonfire, built by the Scouts of Mr Lingley, was lit on the Croft, and altogether the day and its ceremonies will live long in local history. During the day the bells of the parish churches were rung and after the Premier’s broadcast those at St Peter’s were fired in a triumphant manner. 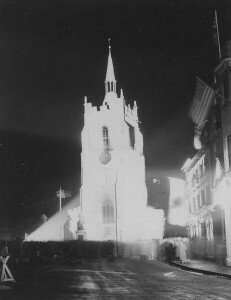 At dusk the centre of the town was illuminated by searchlights, one being in the Old Market Place and one in Ballingdon. These picked out St Peter’s church, giving a lovely effect. Loud speakers blared forth dance music and by midnight there was a general scene of fun and frolic. American troops were confined to quarters. A few high-spirited paratroops displayed remarkable agility in climbing on to buildings from where they snatched flags. They clambered on to Gainsborough’s statue and sat astride the image of the great artist.